The TCAV-L typically provides the average temperature of the top 6 to 8 cm of soil for energy-balance in flux systems. It parallels four thermocouples together into one 24 AWG wire. Each member of a thermocouple pair can then be buried at a different depth. The two pairs are separated at a distance of up to 1 m.
The TCAV uses type E thermocouples, which are comprised of a chromel wire and a constantan wire joined at a measurement junction. A voltage potential is generated when the measurement end of the thermocouple is at a different temperature than the reference end of the thermocouple. The magnitude of the voltage potential is related to the temperature difference. Therefore, temperature can be determined by measuring the differences in potential created at the junction of the two wires. Is it OK to have a TCAV-L connected to a data logger using a very long cable (100 ft/30 m)? Yes, as long as the TCAV-L is measured using a differential measurement instruction. Be sure to connect the shield wire to analog ground. What are the measuring range, accuracy, and resolution of the TCAV-L? The TCAV-L measurement range, accuracy, and resolution are a function of the data logger used to measure the TCAV-L. Refer to the appropriate data logger manual measurement section for more information. What is the temperature range of the TCAV-L? 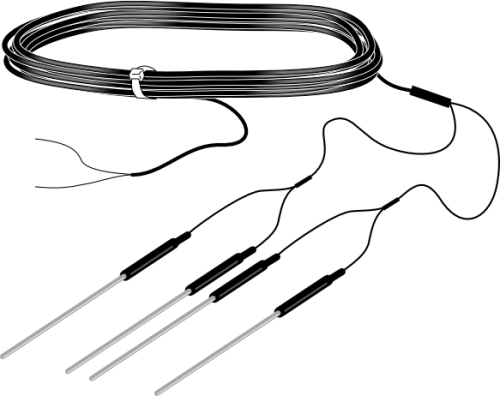 The TCAV-L is constructed using a Type E thermocouple wire. The high-order NIST polynomials were fit over the temperature range of -270° to 1000°C. The temperature range of a TCAV-L on a data logger depends on the measurement range selected in the thermocouple measurement instruction. For example, using a CR3000 and the ±20 mV input range and a reference temperature at 20°C, the TCAV-L temperature range is -270° to 300°C. Refer to the measurement section in the appropriate data logger manual for a detailed discussion on thermocouple measurements. If Short Cut does not list the TCAV-L on its sensor list, what should be done? The TCAV-L is a Type E thermocouple. Use a Type E (chromel –constantan) Thermocouple found in the Sensor | Temperature group.